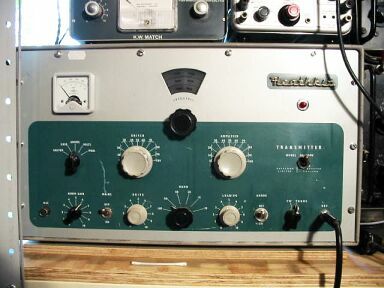 An early amateur radio transmitter, the only external requirements were an antenna, key or microphone and an earth. Panel control allowed Phone or CW operation on all amateur bands up to 30 Mc/s. The DX-100U included three power supplies, low voltage, main HT voltage and fixed bias, four radio frequency stages and four audio stages. 100-125 watts phone 120-140 watts CW. 160, 80, 40, 20, 15 and 10 metres. 80 watts at 500 ohms is available to drive an external modulator or a PA system. 95 to150 volts or 195 to 250 volts AC (45 to 65 cycles) Stand by 150 watts. CW 400 watts intermittent Phone 450-600 watts Continuous. I can supply a copy of the Assembly and Operation Manual that was supplied with the DX100 kit. It has complete constructional layouts and the circuit. The manual is for the DX100U, I also include a circuit of the DX100 as there are slight differences. After a complete renovation my DX100 has given very little trouble, the only additional components to fail were a couple of anode loads in the modulator preamp 100k & 470k as they are difficult to get at I recommend replacing them. If you have trouble tuning up on 160 meters rewind the large extra inductance in the PA anode circuit. Two Circuits diagrams DX100 & DX100U. 22 Layouts construction diagrams and chassis views. Resistance charts, measurement of resistance to chassis from various points. Picture of front panel with controls labelled. Power supply circuit and layout part of main diagram. It is comprehensive and gives all the relevant information to build or renovate a DX100 or DX100U Transmitter, I used this manual to renovate my DX100. DX100 DX100U Assembly and Operation Manual.